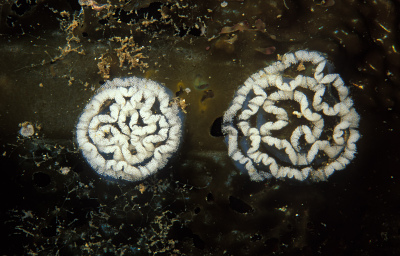 Eggs of nudibranchs, on macrocystis kelp at Yellowbanks, near Santa Cruz. Yellowbanks seems to get a lot of traffic from divers and fishermen, probably because it's a day trip from Santa Barbara or Ventura. It seems to be doing pretty well lately, though.